May 22, 1992: After 15 years, the Maine Mariners leave Portland to become the Providence Bruins. March 26, 1993: The Portland Pirates are born as owner Tom Ebright brings the Baltimore Skipjacks to Maine and signs a three-year lease with the Cumberland County Civic Center. They are affiliated with the Washington Capitals. Oct. 8, 1993: Pirates beat Providence 6-3 in inaugural game. 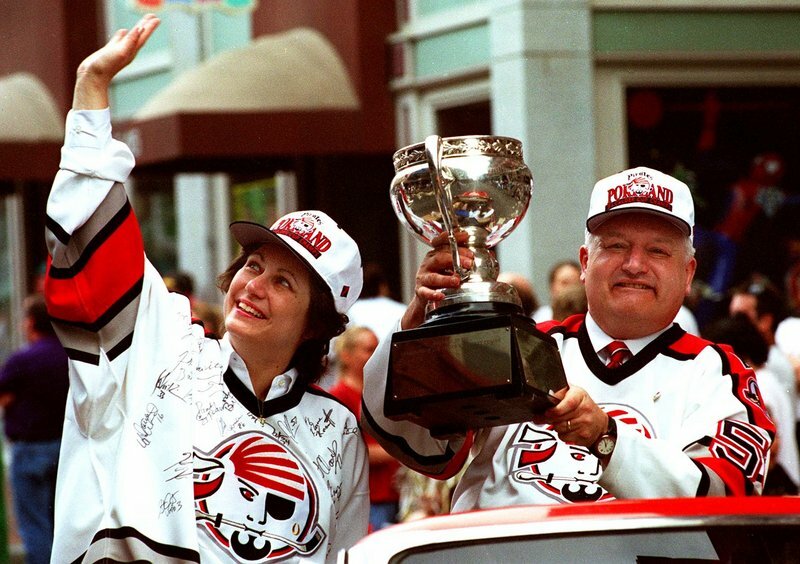 May 30, 1994: Pirates win the AHL’s Calder Cup championship in their first season, beating Moncton 4-1 in the sixth game of the best-of-seven series. Goalie Olaf Kolzig is named MVP. June 13, 1996: Pirates lose 2-1 to Rochester in Game 7 of the Calder Cup finals, after having the worst record in the league in mid-January. July 14, 1997: Tom Ebright dies of a heart attack in a Pennsylvania hospital while awaiting a heart transplant. His widow, Joyce Ebright, becomes majority owner. 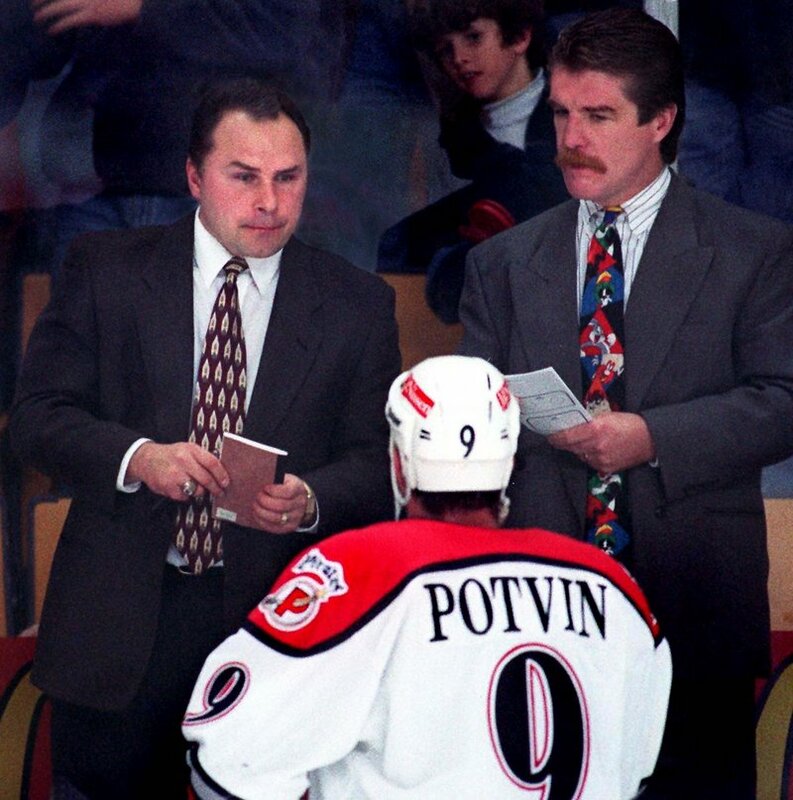 Aug. 7, 1997: Coach Barry Trotz leaves the Pirates to join the expansion Nashville Predators of the NHL. Trotz remains as the only head coach the Predators have ever had. Sept. 24, 1998: The Capitals announce they are sharing their affiliation in Portland with the Chicago Blackhawks. The resulting season (23-50-7) is the worst in Pirates’ six-year history and the dual affiliation ends after one year. Nov. 9, 1998: After two failed sales to local businessmen, David Fisher, his brother Richard and Chester E. Homer, a Kennebunkport businessman, buy out Joyce Ebright’s 65 percent share of the Pirates to become new team owners. Fisher had been the team’s minority owner. Sept. 7, 2000: Lyman Bullard, a Boston sports attorney, and Brian Petrovek, a former U.S. Hockey executive, are announced as the new owners of the Pirates. The sale becomes official on Oct. 20. Feb. 3, 2003: The Civic Center hosts the AHL All-Star Classic, a game won by Canada 10-7 over PlanetUSA but most remembered for its silence. One hour before the game was to begin, the mixer and the amplifier in the building’s sound system malfunctioned. All sound was lost until 2:58 remained in the second period, when the system was repaired. April 27, 2005: The Capitals announce they are ending their 12-year affiliation agreement with Portland to move their minor leaguers to Hershey, Pa.
May 23, 2005: The Pirates sign a five-year affiliation agreement with the Anaheim Ducks. July 18, 2005: Kevin Dineen is announced as the sixth head coach in Pirates’ history. May 30, 2006: The Pirates lose 5-4 in overtime to Hershey in Game 7 of the Eastern Conference finals. It is the first time Portland had advanced past the second round of the playoffs since 1996. May 24, 2008: Another playoff heartbreak as former Pirate Tim Brent scores with 30 seconds left to lift Wilkes-Barre/Scranton past Portland 3-2 in Game 7 of the Eastern Conference finals. June 3, 2008: The Ducks end their affiliation with the Pirates, moving their minor leaguers to Des Moines, Iowa. June 10, 2008: The Buffalo Sabres become the Pirates’ new NHL affiliate, signing a three-year affiliation agreement, with a club option for two more years. Jan. 19, 2010: The second AHL All-Star Classic is held in Portland without a hitch. Canada again wins 10-9 in a shootout over PlanetUSA. March 11, 2010: Petrovek, who is weighing an offer to move the Pirates to Albany, N.Y., announces a long-term extension of the team’s affiliation with Buffalo. March 17, 2010: Civic Center trustees approve a two-year lease extension with the Pirates. 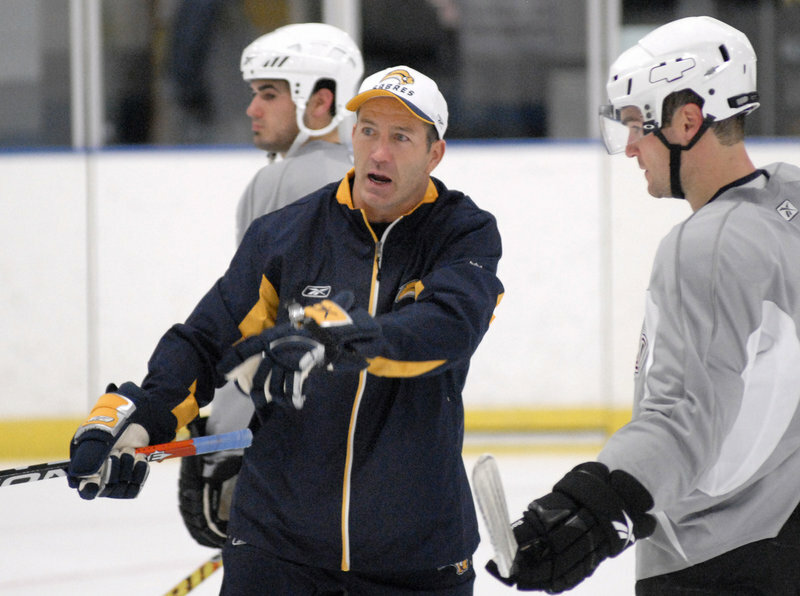 June 1, 2011: Kevin Dineen is hired as head coach of the Florida Panthers. June 24, 2011: The Sabres end their affiliation with the Pirates, moving their minor leaguers to Rochester, N.Y.
June 27, 2011: The Pirates announce a new affiliation with the Phoenix Coyotes.